YES. Lorazepam is addictive. This is even the case when lorazepam is prescribed by a doctor. We review what lorazepam is made of, and how you get addicted to lorazepam here. 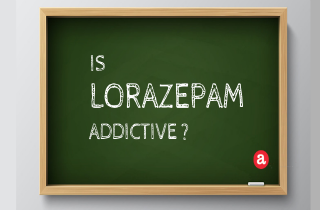 What exactly is it about lorazepam that makes it so addictive? Basically, lorazepam’s euphoric effects. How long do lorazepam effects last – about 6 to 8 hours. Plus, peak levels of lorazepam process relatively quickly through the body. So how do you know if you have a problem with lorazepam addiction? We’ll review these questions here. Then, we invite your questions about the addictive potential of lorazepam at the end. While lorazepam is best-known for its anti-anxiety effects, it’s also sometimes used to treat severe seizures, insomnia, and muscle spasms. Lorazepam is an oral medication, usually given as a tablet, but sometimes also as a liquid. By slowing brain activity, lorazepam exerts its relaxing effects on the user. When taken in large amounts, lorazepam can be abused to create a euphoric high. What is lorazepam made of? Lorazepam is part of the benzodiazepine family of medications. More specifically, lorazepam (initially marketed under the brand names Ativan and Temesta) is a potent short-to-intermediate-acting benzodiazepine. Inactive ingredients that may be added in prescription lorazepam might include monohydrate, magnesium stearate, microcrystalline cellulose, polacriline potassium. Taking lorazepam long-term can usually result in physical dependence. While dependence on lorazepam isn’t necessarily the same as an addiction (it can be hard to tell the difference between the two), there is a subtle distinction. While a physical dependence involves both a tolerance to the effects of the drug, and the inability to stop taking the drug suddenly without withdrawals, addiction has an added psychological dimension. Lorazepam addicts will be unable to function emotionally or psychologically without their medication. How do you get addicted to lorazepam? You’re must less likely to develop a lorazepam addiction if you take lorazepam exactly as directed by a doctor, not in higher doses or greater frequency than recommended. Taking lorazepam in any other way is seen as intentional abuse and greatly increases the risk of lorazepam addiction. For example, mixing lorazepam and alcohol for effect is more risky than taking either separately. A past history of drug or alcohol abuse also puts you at risk for developing other addictions, including one to lorazepam. Do you recognize these signs and symptoms of lorazepam addiction in yourself or someone close to you? If YES, then don’t wait any longer to get help from professionals. See what it’s like to seek help from lorazepam addiction treatment programs and how you can choose the best treatment type, duration, and therapies for you. Do you still have questions about lorazepam’s addiction potential? Please leave them here. We are happy to help answer your questions personally and promptly. If we do not know the answer to your particular question, we will refer you to someone who does. Ok.. so I have been diagnosed several times by my doctor with different types of things.. we will go with the current diagnosis. The shrink says I have psuedo seizures. I am currently taking 1mg pill 2 times a day as well cymbalta, midodrine ,and lamotrigine.. they think I will probably be on this medication for life or until something better comes out. Now when I go to the hospital they inject it. I have never had anything work so well and I’ve been sick for over 6 yrs now. I dont understand why the pills do not calm me down to the point where I dont have any psuedo seizures but the injection does. The pills make me feel tired. But the injection does not.. it just makes me relaxed and calm. What would long term side effects be for either of these. I have seen that it comes in a liquid as well. Is that going to have a different effect? If so do you know how? If I talked to my shrink do you think I could be put on the injection? Hi Gina. I suggest that you consult with your doctor about your issue. Hi Lorraine. I suggest that you consult with your doctor to help you plan an individualized tapering schedule. I have taken lorazepam for at least 4 years by prescription of my psychiatrist. 1 to 2 mg. at bedtime. One usually doesnt help me sleep. Ocassionally I dont take any. I didnt have problems sleeping until. I was diagnosed with major depression and shock treatments 20 yrs. ago. Then @ 8 yrs. ago I had another episode of anxiety and depression, no shock treatments. I did not always contine to need a sleeping med with prescribed pristique 50 mg. daily. That med. worked better than any I tried. I have just retired from 16 years of working as a CNA mostly 3 to 11 shift. Because of this work I have been a night owl for the past 19 years. A high stress job in a senior psyc. ward and health center with every kind of senior illness, dementia to alzhemiers. My lifestyle will change dramatically. I dont feel depressed but do experience anxiety still. Should I cut down on the lorazepam and try to quit taking it. I never can say I sleep well even on it. But if I dont takecit several days and I’m wired, I dont sleep. Work isnt a problem now though so maybe its time to cut it off? I currently am taking 0.5 mg once a day, maybe 3 days a week. I am concerned about getting addicted to the point where even if i need one, i will just work thru my anxiety.any thoughts on me getting addicted? Hi Adriana. I suggest that you speak with your doctor to help you plan an individualized tapering schedule. I have taken lorazepam 1/2 mg for years along with ssri, to control panick attacks! Stopped the ssri and just took 1/2 mg of lorapam at night, now went back on ssri’s which are killing me! My doctor in the last 6 month switched me to 3 different ssri’s, cynmolta, le apron and Zoloft! Omg! I was having migraines, and even passed out and lost 30 pounds! As of spy 7 2016 I weaned off ( under doc care) Zoloft and it horrific side effects are killing me! But I’m still taking lorazepam but upend it to 1/2 mg as needed, no more than 2mg a day! Unfortunately still experiencing dizziness fog nausea and panick attacks! Sounds to me me that I’m addicted to lorazepam ! I’m desperate I don’t trust my doctor any more … What will it take to wean off lorazepam without having panick attacks? Please help! I have been taking 1 mg of Lorazepam for sleep every night for 11 years. Last week my doctor told me I need to go off of it and is reducing my dosage and adding Restoril – 30 mg while titrating off the Lorazepam. I LOVE lorazepam and it has given me great sleep every night and I am worried about coming off of it. I tried to get off it twice and had severe INSOMNIA! Was my dosage considered high? What are the withdrawl side effects? I am totally dependent on this drug to sleep at night. You know what,I used to take loranzopam 3 times aday 1mg went in the hospital,don’t k for ten yearsnow how ,yes I do the good lord. Before surgery my doctor said he would not do the surgery until he took me off all these pain pills the other doctors had given me,he said they didn’t look for the cause,they was killing you,i’m talking about going to doctors to find out why i was hurting so bad for ten years until this one doctor said you have major hernia. And they wonder why i had to change so many doctors. All beleive that all i needed was astronger pain med. T o get back on the subject. One psychiast apologized for started me on benzos,now i’m allergy to most all of .I’m on 0.5mg of loranzopam 1 or 2 if needed,thats kind of hard to figure out,so i try to take it as needed,it be at different,but never to take more than prescribed.I,m trying to help ,pray about it he’ll give you the answer,it may come through others,you never know. Trust Him. God Bless. I have taken Lorazepam half a milligram off and on over the course of several years most of that time on an “as needed basis” for anxiety. Often I would go weeks without taking it. I had a number of stressors in my life starting July 2014 and in September developed high blood pressure and anxiety/panic problems and was put on 1 mg per day (.5 2xdaily) Late February I started to wean off and had no problem going from 1 mg to .5 daily, but the next step was difficult. My doctor had me go to 1/4 mg daily for 10 days then 1/8 mg for a week then 1/8 e/o day for 2 weeks. I cannot get past this last dosage without feeling “wired” and experiencing some confusion at times. Am I going too fast? Today I have been off so far for 65 hours and feel as if I really need that 1/8 mg. Shall I gut it out or go back on a regular dosage. I am nearly 78 yrs and in good health except for being treated (successfully) for HBP with Bystolic and Tramterene HCTZ. How much longer am I going to have to put up with this withdrawal situation? Hello Linda. Ativan is recommended only for short term treatment, which is 2-4 weeks. Continuous long-term use of product is not recommended. So, be careful around this particular medication, and all benzodiazepines in general. Hello Leah. I am so sorry to hear of your loss. I’d suggest that you work on this with multiple professionals: for anxiety, depression, and grief you can really benefit by talking with a psychologist, psychiatrist, nutritionist, religious/community leader, and even a personal trainer. You need to go through the process of grief and then build up healthy patterns in your life. Turning to central nervous system depressants is a short-term strategy that can lead to drug dependence; while the symptoms may be addressed, the underlying condition of grief remains untreated. I lost my precious 43 year old son from lung cancer more than 3 months ago. During the last weeks of his illness and after his death, I have been prescribed and taking 1 mg. Lorazepam at night, because without this, I simply can’t sleep! Can you possibly suggest some other medicine I could take which woudl be non-addictive, help me to sleep and not feel groggy the next morning! I have tried weaning myself off the lorazepam without success. I am desperate! How do I overcome a dependence on lorazepam. I was taking .5 when awakening at 3AM to go back to sleep. I have tried Lunesta and Ambien to sleep through the night but I continue to wake up at 3AM. My doctor said I am “craving” lorazepam. I don’t know why the hell he prescribed this stuff. I am unable to sleep past 3am. Hello Andrea. Thanks for your question. Addiction usually develops as the result of a brain effect on the pleasure centers of the brain called “euphoria”, an extreme sense of well being. Just a little under 10% of the population really registers this effect, or seeks it out. If you get high from your dose of lorazepam, it’s possible that you can get addicted to it. But under normal therapeutic parameters…as long as you are taking lorazepam as prescribed and do not increase dose or dosing frequency, you may develop physical dependence on lorazepam. But this is characteristic of an expected reason when taking any benzodiazepine regulalrly and DOES NOT necessarily indicate addiction. Do you feel high when on lorazepam? If I’m prescribed 20 1mg pills of lorazepam and take one pill at bed time, as doctor said to do…will I get addicted to them? I have no refills, its jus 20 pills once a night for 20 nights. Thank you.